I have decided to include this article in this issue of EAR CANDY because it shows insight about SMiLE from a 1983 perspective and because of all the SMiLE-related events of 2004. It is used with permission from the author. An eerie soundtrack of fire music made of violins and bass, which is more devilish than cataclysmic; pounding drums and low chants, which are designed to put American Indians in your living room; the repetition of a lyric phrase, which continues for so long that a mild sense of paranoia develops. These are sounds from Smile. A half-dozen or so unreleased tracks from the Smile sessions have leaked out and are spreading around on tape. Although these fragments paint only a corner of the picture that would have been Smile, they suggest a direction Brian's mind was taking and the large obstacle that faced him in 1967. With his new music, Wilson was clearly moving out of the art form that had been the basis for his great successes. For years he had incorporated influences of R&B, folk, jazz, and more into pop. The popular song was his milieu, and as he would lay down inspired, unusual musical plots within its confines, he would rely on many of its parameters. If he used creative harmonics in "The Little Girl I Once Knew"-pushing the limits of pop-he nevertheless was careful to retain the essence of pop and this beatify his experiments. With his vision, that was a guarantee. With Smile, there would have been no such guarantee. And the theories to explain Brian's refusal to finish Smile go on and on. Another theory, a favorite of mine, involves the easy boredom that seemed to be part of Brian's nature. People are amazed when they learn that, in the early days, he would pump out three or four albums in the space of a year. Yet that is how he worked best-rapidly-finishing before he would tire of an album. His most drawn-out project was Pet Sounds, yet that album contained studio chatter recognizable during quieter moments. Did boredom set in before Wilson could make a final cleansing/revision of the tracks? Smile would have been a conceptual album requiring an extended, complex organization-like one long song. Could the man who had just enough patience to complete a 3-minute song sustain an interest in such an extended form? Perhaps it was not so much that Wilson failed to envision the completed Smile project as that the Smile project failed to hold his interest. Perhaps his mind moved past the project before it was completed. Yet the musical impulses on the Smile tapes are fascinating. 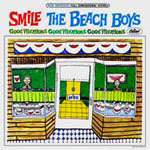 The fact that the Beach Boys' recording company does not force the release of a Smile anthology of some sort continues to puzzle me.